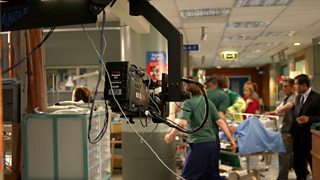 Editor's Note: Following Olly Perkin's recent blog on the Casualty Writers Shadow Scheme, Laura Turner blogs for us about her experience so far on the equivalent scheme for Holby City. 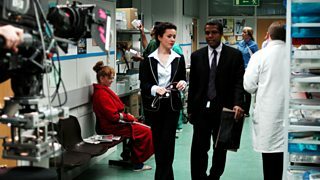 Shadow Schemes are run for writers on all the BBC's Continuing Drama shows: EastEnders, Doctors, Casualty and Holby City. Writers write. Simple. Except writers also wait. And wait. For the phone to ring, their emails to refresh – and the past couple of months have been full of nervous excitement after applying for the Holby City shadow scheme. I’ve watched the show since its inception and its strong-willed women (Jasmine; Connie; Jac) have influenced the kind of intelligent, aspirational, multi-dimensional female characters I explore in my writing. Continuing drama edges its way into your life without you realising it through the power of its characters and storytelling. For me, a show like that is a writer’s dream. After submitting a spec script (a radio play shortlisted for the Alfred Bradley Bursary Award earlier this year) and half a page detailing an idea for a guest story, the wait began. I was shortlisted – one step closer. An interview followed, then a rewrite of my pitch. Cue more waiting. Then, I heard I’d got a place. When I arrive at BBC Elstree for the training days, it’s with a healthy dose of déjà vu. In 2010 I was part of the writing team for EastEnders spin-off E20. Our training also took place at Elstree, in the very room where eight writers now gather for an insight into writing Holby. E20 crystallised my desire to work in continuing drama. The BBC flagship shows symbolise what compels me to write: stories that get inside your head and characters that get inside your heart whether you want them to or not. The first day is investigating story, dissecting films with Henry Swindell from BBC Writersroom. We explore five act structure, in which the obstacles stopping the protagonist from getting what they want grow incrementally and affect whether the main character discovers what they need to be complete. It sounds technical but it’s there in most mainstream stories. Holby City is about giving every character a meaningful journey but not necessarily one that’s life altering. Believable change is small, especially with regular characters. Producer Anne Edyvean and Series Editor Sophia Rashid warn us off "realisation moments"; if a character learns something, make it active, visual, concrete. Show, don’t tell. The show is led by movement, pace, energy and high stakes or the audience switches off. Knowing what doesn’t work is definitely a good place to start. 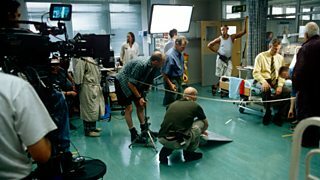 Holby City - setting up a scene in 2001. Other than E20 I've mainly worked in theatre, whilst others have experience in factual documentary, factual entertainment, radio and comedy. It’s a reminder there’s no one route into this job. I write because I live in about ten different imaginary worlds inside my head at one time and that’s just not healthy. So I channel them onto the page and inflict them on other people. Drama is the most immediate way to do that. Holby City happens right inside the nation’s homes which places a level of responsibility on a writer that’s a privilege and a thrill. Writing is about never forgetting your audience, however removed they feel when you’re on your own writing at 3am. But Holby aren’t leaving us to go it alone. On day two we meet our script editor James who’ll be supporting us through the process and we have visits from Series Producer Simon Harper, Executive Producer Oliver Kent and writer Joe Ainsworth. They speak with huge passion about the show and how it’s at its best when it’s full of heart, warmth, humour and humanity. Talking with Joe is a huge privilege and he encourages us to be brave, bold and instinctive with our storytelling. It’s about writing the episode of Holby only you could write. 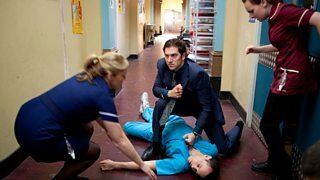 Holby City: A dramatic moment from Series 12 in 2010. Now the reality of it all is sinking in. We’ve been given a story doc to start crafting our stories and an imminent set visit to help visualise how we’ll bring them to life. The excitement for me is two-fold: writing for characters I know and love whilst crafting unique guest stories filled with clever meds, witty banter and emotional punch. It’s a challenge. But it’s the challenges that make the waiting worthwhile.